The Welfare Reform and Work Bill is the means by which many of the items announced in the July Budget will come into force, including reductions to the benefit cap; freezing Child Benefit + means-tested benefits; capping Child Tax Credit to 2 children; removing the family premium in Universal Credit; reducing ESA WRAG level to Jobseeker’s Allowance; requiring claimant parents of 3 year olds to look for work (or increase hours of work in 2 parent low income household); and requiring parents of 1 and 2 year olds to complete ‘work requirements’ directed by the JobCentre as a condition of receiving benefit. The Bill is only 29 pages, which is super-short as these things go, and the Explanatory Notes here (and here as pdf) are also only 30 pages, with a lot of white space. Flicking through the Explanatory Notes pdf + the diagrams showing the impact of various measures produced by the Institute of Fiscal Studies is a quick way to get up to speed. Below is a list of items in the Welfare Benefits section of the Welfare Reform and Work Bill which is to have its Second Reading in the House of Commons on July 21st 2015. (b) £20,000 or £13,400, for other persons. (b) for remaining purposes, on 6 April 2017. Secretary of State may by regulations appoint. NB I may be missing something obvious but I can’t find anything in the Welfare Reform and Work Bill about the cut-off point for Tax Credits or the higher taper rate as announced in the July Budget. 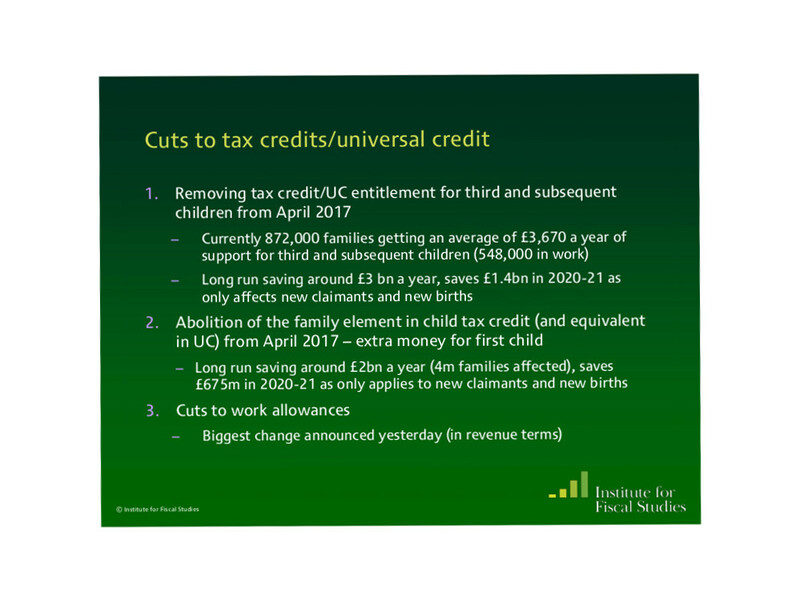 Questions have been raised about the cut-off for Child Tax Credits but the Bill says nothing about this. Student maintenance grants being replaced by loans isn’t in there either. (c) section 23, section 24, this section and section 26. (c) sections 4, 5 and 6. (b) appoint different days for different cases or purposes. this section so far as relating to section 7 or 8. (10) Regulations under this section must be made by statutory instrument.